For this week’s cooking challenge, I haven’t been able to find an inspiring recipe to test out this weekend, so I cheated. I didn’t “really” cook anything new, but sort of. When I was scouring the internet for duck confit recipes a few weeks ago, I read in one of the recipes that you can put an entire bulb of garlic in with the duck while making the confit, and the garlic becomes garlic confit. That was an interesting concept. So in this last batch of duck confit I made, I threw in a bulb of garlic (with the top sliced off). The recipe didn’t say anything about how to use this garlic confit. I figured we’ll just try eating it with the duck. 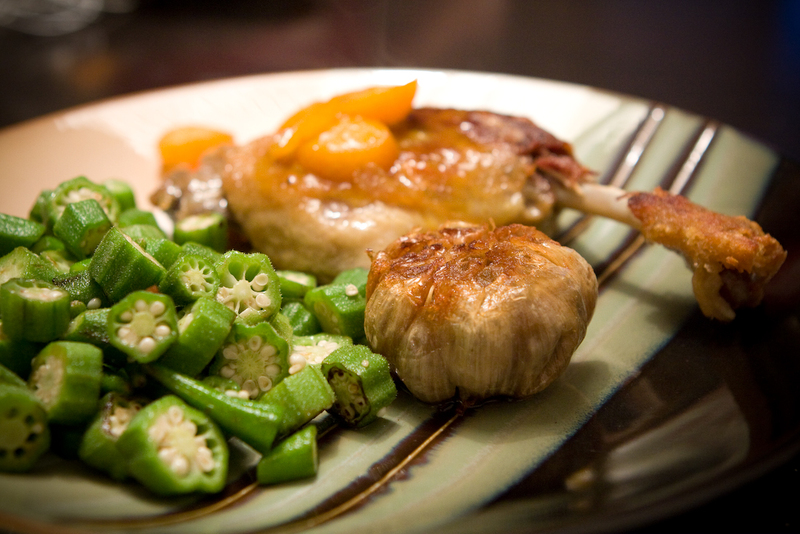 I fished the bulb out of the duck fat, fried it a bit in a pan to heat it through, and just served it with the duck confit for lunch yesterday, along with some sauteed okra. The garlic confit was a hit with both Cliff and I. Joshua enjoyed it too. Unfortunately we only had one bulb to share, leaving all of us craving for more. The cloves have turned brown from the cooking process. It has lost the pungent-ness, and become mild and sweet and fragrant. Using a fork, you can easily squish the flesh out of the paper. It’s almost like a spread. You can mash it a little and eat it with the duck. I’m sure it would have been a good side with pretty much anything. I’m sure it’ll be an awesome addition to a pasta sauce, roasted vegetables, maybe a steak sauce, or anything you can use mashed garlic with. This entry was posted in Cooking and tagged cooking, cooking challenge, duck confit, garlic confit by angelasaito. Bookmark the permalink.